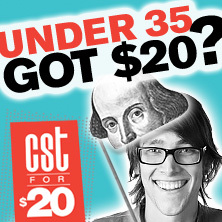 JOE DEMPSEY CHICAGO SHAKESPEARE: Short Shakespeare! The Taming of the Shrew. CHICAGO: 20,000 Leagues Under the Seas (Lookingglass Theatre Company); The Rembrandt (Steppenwolf Theatre Company); Ah, Wilderness! (Goodman Theatre); productions with Northlight Theatre, Court Theatre, Lookingglass Theatre Company, Theater Wit, Victory Gardens Theater, Remy Bumppo Theatre Company. REGIONAL: Faceless (The Repertory Theatre of St. Louis); productions with Milwaukee Repertory Theater, Cincinnati Playhouse in the Park; Baltimore Center Stage; Kansas City Repertory Theatre; City Theatre Company (Pittsburgh). Mr. Dempsey is an artistic affiliate with American Blues Theater, and is a former member of The Second City National Touring Company and the Neo-Futurists.